Uh, actually we mean to the bat cave. Wait, scratch that— to the kitchen, we go! Ugh, we're so confused, which one is it? Where are we going? Are we coming to the rescue, retreating to the Bat Cave or whipping up something delicious in the kitchen? Luckily, with this Batgirl fashion apron, you don't have to choose. It's perfect for wearing when saving someone from a villain, it's perfect for wearing when retiring to the Bat Cave, and it's perfect for wearing when cooking a casserole. It's hard to find one ideal garment that's great for so many diverse activities. Bake a batch of brownies then head straight to the Bat Cave for some bonding time with Alfred. The officially licensed Batgirl Fashion Apron is made from 100% polyester twill fabric. It features a sweetheart neckline, reminiscent of aprons used in the 1950's. 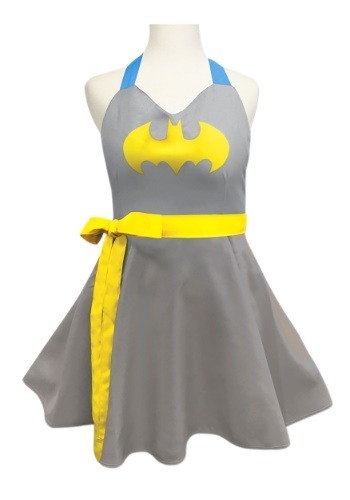 The apron also has the Batgirl logo on the front, solid neck straps, a self-fabric waist tie, and a ruffled hemline. You can bake or cook anything when wearing this novelty apron, but we recommend baking yellow-frosted, bat-shaped cookies. They'll match your cute cooking ensemble and taste amazing.